The Kansas City metro unemployment rate continued its slow decline in November, dropping from 6.4 percent to 6.3 percent. One year ago, in November 2011, the rate was 7.7 percent. The story behind the lower rate remains the same this month: employment is dropping, but so is the labor force. According to the Bureau of Labor Statistic’s seasonally adjusted data, the region’s employment has dropped by 5,791 between November 2011 and November 2012. Over that same period, the labor force fell by more than 21,000. It stands to reason that the unemployment rate would be trending down. Economic activity is picking up. We are seeing more home sales, as well as growth in the construction industry. Help-wanted ads remain at high levels. It is the decline in employment that continues to puzzle us. With the economy beginning to grow, shouldn't we see an uptick in jobs? We use the Local Area Unemployment Statistics (LAUS) as our data source. The LAUS data is the result of calculations based on national, state and local data and trends. We like this source because it is timely and adjusted for seasonal change. If we see a trend in the unemployment rate using LAUS, we know that it is a real trend and not the result of seasonal hiring practices. 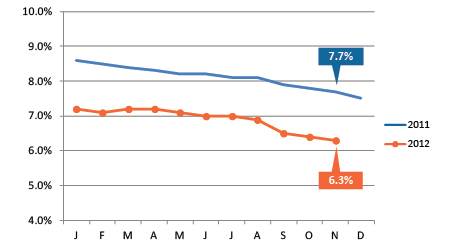 The LAUS shows the region’s employment flat for the past six months after declining in the first part of 2012. As we've mentioned before, there are other data sources we can use. The Bureau of Labor Statistics compiles its Current Employment Statistics (CES) from a monthly, nationwide survey of 486,000 worksites. CES data provides us with another estimate of area employment, and it shows our local employment at the same level as one year ago. So regardless of the source, area employment continues to be stagnant. Clearly, some industries (information technology and health care, for example) are expanding their employment while others (public administration) are contracting. With next month’s data release, we will have all the data for 2012. At that time we will analyze all these varied data sources and see which paints the most realistic employment picture for our region. Look for that detailed analysis in next month’s newsletter. Employment dropped slightly in November 2012. 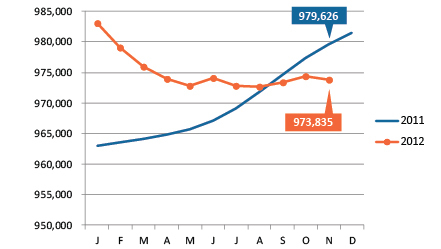 It has dropped by 5,791 since November 2011. The labor force also continued to decline in November. The unemployment rate continues its steady decline and now stands at 6.3 percent. 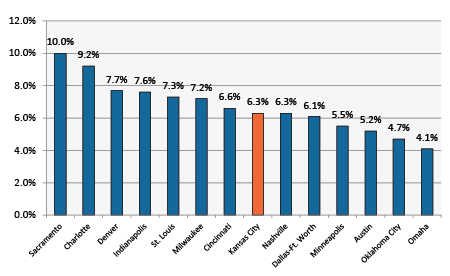 Kansas City's unemployment rate is firmly in the middle of our peers. 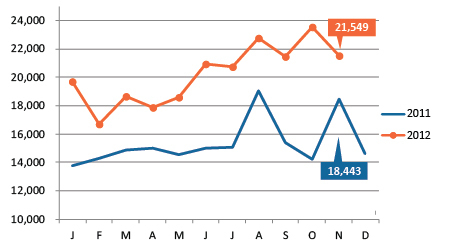 Job postings declined slightly in November but remain much higher than one year earlier. It's good to be an astronomer. And maybe not the best time to work in the media. A recent Wall Street Journal article breaks down unemployment rates by occupation — from a minisucle 0.3 percent rate for astronomers to a whopping 43.5 percent for media and communication equipment workers. The article includes a table with 2011 and 2012 unemployment rates for each occupation, along with the percent change. The data can be sorted by clicking on each column.